Growing Weekly! Why not come to the one where people buy! I hear all sorts of rumours about other events and Car Boots. Normally when a Car Boot is getting bad reviews it normally comes from the Car Boot trying to charge too much for something. Many of these stories I take with a pinch of salt as Car Boots have good and bad weeks and I expect we all get bad reviews for something we aren't even aware of or are unable to respond to. Recently I had two good reviews for the car boot which is nice. But the last one said it was great for a small car boot.... Call me old fashion but, is that not a dig. We try very hard to increase numbers and to grow a car boot but, at the end of the day I don't want it to become a horrible Car Boot to go to. If having lots of sellers means we acquire buyers that harrass the sellers I wouldn't be happy. We all get the sellers and buyers that turn up far too early and expect to unearth a Rembrandt. Actually the one thing that is on my mind and that is the two ladies that ysed to turn up regularly and don't seem to any more. Maybe they do but, being in the food van I don't see them. That's what I need. I need someone who can cook in the burger van that can step in for me so I can see the people again. I do miss meeting the sellers. I really have struggled to find someone to help me on the cooking side. I don't want to bring in another Burger Van but, would like someone who enjoys cooking and the stress of being in the van. Someone who would like to step in and run the show the show here and there. Or maybe every week. I've found two great kids who help me but, it won't be long before early Sundays in a Burger Van doesn't appeal. I could be wrong. My apologies for being a bit slack this year. It's all happened so quickly after the break and before you know it the November to March break is over and you have weeks to get ready. Literally a week before I was having the food trailer tiled and quickly painted (by me). It seemed such a good idea to tile the food trailer until it came to lifting it onto the back of the car. It appears to have doubled in weight and will have to be jacked up or I get onto steroids to manage to lift the thing. Well, the first week back we had 80 0dd sellers which was an anmazing start to the year. Normally it builds slowly as the weather kicks in and then decreases as everyone goes on holiday and then builds again. This year it's been regularly high with only one low week when the forecast was poor. We have had a few weeks were people stupidly read that it's going to rain trather than look out the window in the morning, so frustrating... Last Sunday there were almost 100 sellers and it was lovely weather and a good solid buying crowd. Lots of smiley faces as most had sold well. 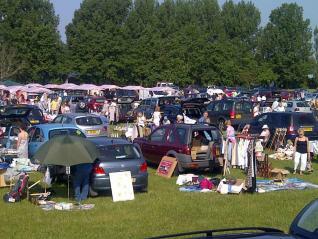 Another sucessful Sunday Car Boot yesterday and I was pleased to see so many people at Stonham. As the schools have broken up you really notice the number of holiday makers in Suffolk. We had HESFES there for the week and it wasn't quite as full in past years as it was a last minute organised move for them as they were due to go to Wales but, there were certainly enough at the Car Boot and it was a very busy day. I hope everyone sold well. Next Sunday we have one of the VW Shows on and have over 500 staying at Stonham all week so, another bumper day next Sunday with many turning up to show their cars to everyone. We are getting good numbers on a regu;lar basis now and all the stalls have been reserved for quite a while now. If you haven't been for a while do re-visit as we have the VW Car Show this Sunday followed by a Stonham Fun Day and then followed by the Classic Car Show so, good events with new people at the Car Boot. The Fun Day is a new event but, if it has lots for the kids then, it should be good too. Something that I will point out is that the VW show on Sunday is free to enter which is great and really a great way of getting people into the shpow to see the cars. Do take advantage of that and have a look. Last thing as I'm always struggling to get time on here these days but, I am comtemplating a Tuesday Car Boot at Stonham Barns and i'm listening to hear what people think about this. I know that there isn't presently one on a Tuesday nearby so, good feedback from everyone about this will make that happen. Where have I been. I think the whole market thing distracted me. Not impressed at all and only yesterday I noticed that the same man is approaching sellers and still offering some sort of market thing. Has the main got no shame. Really upsets me. It has taken me over 4 years to build the reputation it has and he appears and wants to just grab people from the Car Boot. The morality of some people is just wrong. I have seen this a lot lately and I think i've moaned about this before in this blog. My partner spent ages choosing twhere to open her shop and picked a place where there were no competitors and nothing similar. Suddenly, everyone sees something that is going well and decides to copy the idea. I was brought up in Essex and in Essex people would maybe copy an idea but look to operate the same idea in a place where it would also be the only place offering that. In Suffolk people seem to copy the idea and then run it at the same venue. Obviously, it's upsetting that it's allowed by the owners but, I woudn't have the cheek to do something like that. Naturally, that brings me back to the market chap. his market has upset everyone at Stonham and it just won't work so, I have no idea what he is trying next but, it won't work at Stonham because you have shops that will always be upset with people offering the same services as them. Running the Car Boot has been restricted because of the various things I am not allowed to have selling at the Car Boot. I have slowly and carefully kept everyone on my side with this but, we would be far bigger if we could allow plant sellers freely into Stonham. One thing I have been asked to do is to run a midweek Car Boot at Stonham. I've been reluctant to in the past but, have started to look at possibly running one on a Tuesday as Stonham is starting to orgaise more and more activities to attract people to Stonham. The next thing is coach tours and with this growing we can expect a much larger instant crowd at Stonham. This added to the campers and holiday home people we have the start of a crowd. Added to this the fact that there isn't any local Car Boots on a Tuesday we could be able to generate enough interest for a Tuesday Car Boot. Let me know any thoughts you may have. Last Sunday was possibly the worst we have had this year as we have been really lucky with the weather. Sadly, despite all the covered stalls being booked for possibly 8 in a row weeks the forecast of great weather on Sunday didn't materialise. Instead we had on off rain followed by huge downpours and huge puddles. Amazingly we didn't have anyone stuck on the field. Either way, we opened and atempted a Car Boot. We did the best we could but so many were put off of coming out in the on off rain. This has been the first week it has been so quiet but, I expect most other Car Boots didn't open or closely very early. A very good week for weather and turn out. Over 50 sellers which means we will have to move to the other side and I hope the good weather can run for two weeks in a row. Our good friends at the Market placed a bit too many signs up and confused a few sellers which wasn't appreciated but, I will ask for them not to be placed near our entrance. I've had a few emails with reard to the Market. No, nothing to do with me as it seems a totally daft thing to do at the same time as the Car Boot especially as it seems to be 98% food offered. Only 3 or possibly 4 stalls so, not a market as such. It's always easy to get food outlets to turn up as they are all desperate for a venue but, surely the restaurant will put pay to this. As I said before i've not sold this or not sold that to keep the peace with the shops and here is a total stranger opening up everything that is already at Stonham. Really not impressed especially as the organiser put signs all around the Car Boot entrance and confused all the people turning up for the Car Boot. What can I say. To be honest Markets don't work. You only have to look at the other ones in towns to see that they are struggling. They should have a good think about an event that no one else is doing and stop trying to steal other people's business. I can't say how angry I am that it has been allowed. At the same time if they actually advertised in places other than exactly the same places that we do it could bring extra people in but, whilst it has 3 to 4 food outlets it's a complete waste of time. To me this really sums up Suffolk. How many times have I seen people try and do exactly the same thing as someone else and, to be make it worse, try and open at the same place. I wouldn't do that. It's embarrassing. If I saw something that I thought was a great idea i'd ask them if they would be ok with me duplicating but, doing it 10 miles away or in another place. I wouldn't want to do it at the same place. I'd probably ask for their help or whether it would be worth connecting it. After all it's their idea. Having said all that I'd rather come up with my own idea. I notice that a lot of people advertise their Car Boots as Suffolk's friendliest or copy the same wording I use. I see this with Stonham doing this for their literature. It doesn't bother me. I seem to be moaning all the time on here which isn't good. I do enjoy the car boots but, probably need someone to take over the cooking on the food van and allow me to talk to the sellers and buyers more. I used to, which I really enjoyed. I haven't actually had a real holiday in over 4 years. I have to squeeze it into a week because I like to make sure everything runs smoothly. Anyway, enough of me moaning. I wonder how long the market man will attempt to run? For anyone considering selling at the market - I won't allow anyone selling hot food at the Car Boot presently. It's not right because of the restaurant. The weather forecast was quite poor but, considering this we have 30 plus sellers and the rain held off for most of it. The field is now fine and maybe by next week we will have our old field in operation. The market was on which comprised of 3 sellers and 2 of those were food. I cannot believe that the Restaurant will put up with that. It's even more competition for them and it's something that I wasn't allowed to bring in. Anyone can bring in food sellers which means it's presently not a market but Stowmarket High Street. Quite disappointed that there aren't genuine market people. The reason being is that nothing new is being sold at it. I suggest to Mr Market man is that he tries to get a meat seller or a bread seller. I have tried myself at Stonham but, I stopped at that as I didn't want to upset the shops by selling the same things that they sell. I know how hard it is to run a shop and how upsetting it is to look forward to the busy weekend only to have someone else cutting yoir prices at a Market. With regard to the Car Boot I think it will be a good year, as I said earlier, because a lot of the old faces are back and once the warm weather comes we will fill up with buyers and sellers. I know that our rival Car Boots will not be enjoying the forecasts or weather but, being at Stonham we do still get sellers because they know that Stonham has much more to offfer the public and therefore they still sell well even if the weather isn't great. It's probably fair that I let the Market get on with what it is doing and concentrte on what we do and what we do well, so, hope to see many more of you at the Car Boot this Sunday where the weather looks ok.
Another good crowd considering the poor forecast. At least this time there was no road closed or diversion. I think we are going to have a good year as it's started positively and there's a few faces I haven't seen for a while which is good. This Sunday i'm expecting a good crowd for Bank Holiday Sunday and I have bookings coming in already for Sunday which is excellent as they may sell out. Something that i've been weary of is the start of a new market at Stonham. I think it appears to be similar to the Farmers Market so maybe it will add to the crowd of buyers. The chap didn't do a very good job initially when he spoke to me about it and immediately put my back up. Having a website covered in Car Boot prices didn't help but these have been removed and we will see on Sunday how they do. Seeing as it's on the same day as me it seems to be wrong but, there isn't a great deal I can do but, we will see. It would have made sense to start on Saturday or later on a Sunday but, they insist upon starting at the same time as the car boot so we will see how long before the sellers realise they can sell for less at the Car Boot. I will re-think all of this once i've chatted to person two but, at present it seems to be so wrong to utilise my crowd to start an event. Surely, anyone in their right mind would realise that it is not going to go down well with me seeing as I started the car boot from nothing. Suddenly someone comes along and opens an event using my crowd. Stonham before the Car Boot was very dead on a Sunday. The Car Boot has brought life to Sundays. On top of that I have had to start a car boot with numerous can't do's - such as no commercial sellers and no commercial plant sellers. I've had numerous offers to take on various suppliers but, plodded along and followed the stipulations. It will be interesting to see who is allowed to sell at the market. Stonham Barns Sunday Car Boot has a great reputation and it's this reputation that brings in families and sellers of all ages. We don't get hagglers or people trying to take items. Instead you get a very friendly dignified crowd and a very knowledgeable one. It is this feeling that I think makes people want to sell at the Car Boot. Of course, not eveyone sells at the Car Boot but, the feedback has been good lately. I may be wrong about the market and will talk to the chap today. I'm hoping that he is after a different crowd and it will compliment us but, we will see. I have had to put up with so many wallies opening and shutting things and people removing signs and placing ones in front of mine. I have argued but compromised and then enjoyed the following week when it was just the car boot again. The market wants to run weekly so I will judge them after a few appearances and we will see how many sellers they have. We will also see if the owner of it will be around all year or just a few weeks. Stonham isn't an instant crowd. I have nurtured mine over 4 years. If I hadn't then he wouldn't have had a market. I think he my find it hard to compete with £5 and £10 selling at the Car Boot especially as we start later to avoid the wet weather. We started in March this year because of the weather, wet fields and general lack of interest in Car Boots in February. Who knows what times he expects to run from and too. Either way we will see how long he manages to run. It certainly helps when he has my crowd to help but, the sellers will see the car boot and wonder why they are selling for more than £5 or £10. I could be wrong but, i'm an old cynic and something just feels very wrong. In Essex, people wouldn't do this. If they knew someone was already running something there they would approach the individual. Most people would pick a different place where there wasn't one. Either way I know the sellers and buyers enough to know that they have some loyalty and the sellers certainly wouldn't pay more to sell at Stonham. If he is purely after Market sellers/commercial sellers then he is welcome to them. I expect the shops will complain but, if it doesn't affect my crowd then everyone will be happy. The food trailer offers excellent food at the car boot so, maybe we will win either way. See you on Sunday and after my chat with the market man hopefully I will be able to amend my thoughts on the market. Well that was a surprise. 35 odd sellers appeared and the first warmer weather brought lots more sellers. Naturally, just to throw a spanner in the works, the road was closed forcing everyone to take a 5 mile detour to get to Stonham. Despite that we had a good day and we even opened the grass for sellers so, its full steam ahead. Looking for good weather this Sunday and expecting numbers of buyers and sellers to increase weekly now. 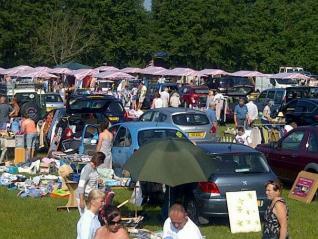 Remember that we are still the cheapest Car Boot in Suffolk were you can sell from £5 and pay no more than £10. Finally back and to be honest I had the usual starting nerves but was pleasantly surprised. Mothers Day was possibly the worst starting day but we have to start some time. If the start of the year is going to be this wet next year we may have to start later still or move it temporarily into the showground on the hard ground. We will see how long before everything hardens to decide that for next year. We didn't get a huge numbers of sellers but enough to have a Car Boot. It was extremely cold so many left very early but - we are off and running and I expect that the ground will be better next week as it looks like a week of dry weather ahead after the initial two days of potential rain. Things dry up quite quickly though. Only 2 more Car Boots this year left and I think it's probably the right decision. The Firework night and all the rain after has softened the field and because of that we have moved to the other side again. Last Sunday was blowing a gale and I know that all the Car Boots struggled last Sunday (15th November). We now have the 22nd and the 29th which is shared with the Xmas Craft Fair so, we are expecing two good last Sundays this year. Obviously we are in the hands of the Gods with the weather but, we have had sellers every Sunday this year even the washed out days we have had sellers and buyers so I must say a huge thanks to everyone who came. Seriously though, we just don't. It isn't that it's dead as some weeks we are absolutely packed out it's just that it really isn't the place to need to rush around. The whole idea was that it was fun and people would feel that they wanted to stay a while and relax. I have high hopes for next year but, at the same time think that we migjht be sensible to end midway through November or at the end of October and have a few Xmas Car Boots only. February last year was wet and soggy so, March would be a better idea I think. The other Car Boots are starting before us but, we trust our regulars to be back for the first one in March. I've been busy as usual organising the Car Boot and unfortunately something has to give. hence, the blog has struggled lately. Not to say I haven't been as active as always promoting the Car Boot. The weather has been amazing lately and I can't remember the last rainfall we had on a Sunday. Needless to say we have had a few windy and grim mornings but, many have flourished into good days. Lots has gone on since I last scribbled. The number of sellers has been pretty consistent hovering around the 50 to 80 mark sometimes more and sometimes less but, the number of buyers has been excellent. I do really miss being able to wander around the Car Boot and chatting to everyone as i'm presently head chef on the food trailer. The food trailer is vital to keeping the Car Boot alive so, I've had to put young Ian in charge of operations in the field. This Sunday will be Stan's last day for a while as he has an operation on his back so, I hope that many of you make a point of saying good luck to Stan. Stan is one of those characters that has been at the Car Boot since the beginning and he collects weekly for Help for Heroes. He is definitely a character with his tombola and his constant attempts at selling his books and poems. He probably drives a few of you up the wall but, without Stan we could never have carried on for as long as we have. Running a Car Boot relies heavily on the volunteers and helpers. Stan helps set up the stalls and with me are the last two to clear up the stalls/covers and clean up. So, I will definitely miss Stan. He is also the provider of energy drinks later in the day. Contrary to popular belief running a Car Boot is hard work and looking back on weeks gone by I can remember huddling around the tea pot and clearing snow off the Car Park and every week Stan would be there no matter the weather. We don't open all year round now but, when we did i guarantee that i can't remember many when Stan wasn't there. As much a pain he can be his heart is definitely in the right place and for someone that has had major heart surgery is invaluable to the Car Boot. So, I hope that many will come this Sunday and say good luck to him. Without sticking to just this i will say that I'm always amazed by Stan's dedication to raise money for Help for Heroes. Stan was in the Army (Vetinary Corp.) as he always wanted to work with animals. Many people probably view this as a skip in the park keepin the dogs up to scratch but, this would have been out in the field with the animals whilst everything flew past. I know that Stan was recently moved by a limbless army chap at Stonham selling. The poor chap made a point of thanking Stan for all the money he raised which went towards helping him recover. He made a big point of saying without people like him he wouldn't be here today recovered and coping. He gave Stan some of his army possessions which he was honoured to receive. Anyhow, I could fill the page with things about Stan but, I won't. I'm hoping for the weather to carry on as it has and i wil say that we are getting a great buying crowd. Last Sunday was a little subdued but, it was cold and there ere quite a few events in Suffolk that day. It was still a good crowd though. To be continued..
Well, what can I say. We've managed to open for all the recent weeks and despite some rain, poor forecasts we are going ok. I was a little disappointed with last Sundays numbers of sellers but generally we've averaged about 80 sellers. last Sunday was a little strange as there didn't seem to be any reason not to be busy as the weather was forcast ok and it was a nice day. maybe there was a dog event on or possibly the big Antique Fair not too far away but either way it seemed a little quieter than normal. Next Sunday will be completely different as ofr the first time since i've been running the car Boot at Stonham we have a huge event at Stonham. Runour has it that 3500 people have booked to camp there which means absolute chaos on the Sunday. I've masked off our area so, no one can use our field but, i'm a litlle worried with this many people coming to Stonham. It's potentially a great day to sell at the Car Boot but, i'm also worried how many could turn up to sell but, we'll worry about that on Sunday. Don't be put off as i'm sure we can squeeze you all in but, until I see how they have squashed the 3500 in the fields and showground will I be able to plan properly. From past experience no one seems to organise these events correctly and people have a habit of ignoring everything and trying to set up next to the toilets. We will see. I don't particularly enjoy moving people after they have set up but - the stalls give them a big enough hint that it's fenced off. I probably won't know till Friday when I put the boards up. Fun and games. Either way, it should be a great Car Boot and one that goes on longer than usual. Well, finally back on here. As I said before I've been reluctant to praise the weather as it immediately snows if I do that. But, we have had a great run. Even last week when there was the threat of rain and promise of rain later in the day plus rain in the morning we still managed to get 50 sellers. Considering all of that I was impressed with the numbers and also pleased I didn't change my mind and open on Bank Holiday Monday. Most other Car Boots struggled last Sunday and because of that we did get a few extras from other Car Boots. Naturally, with the weather not being great numbers were lower last Sunday but, I still felt there were decent numbers. We have been really busy when the weather has been better so, all in all I though it was a good turnout (buyers and sellers) last Sunday. I did get a comment on this weeks advertising on Facebook saying they were disappointed with last weeks Car Boot.. I did respond and i think I answered the point as politely as possible. Basically, I said that with the forecast and the early mornings downpour we were possibly the only Car Boot that opened and yes, because of this we probably had 25/50% of the crowd we would have got if the weather was perfect but - we did still get a good crowd and Car Boots are like that. You can't guarantee sales and despite her being disappointed we still had enough people saying they had sold well. I left it at that. It's very tempting to speak and speak on the topic but, it goes into the old response i've said a million times and that is that it only takes one person for it to become a great day. If she had sold a few bigger items suddenly, she would have been saying what a wonderful Car Boot it was and how well she had done and what marvelous products she had and how great the atmosphere was.... I did mention that I hoped she noticed the atmosphere and appreciated that as we are proud of this and the fact that you can set up in peace. It does mean a lot to me that we don't get people diving into your boot or have people attempting to steal your items. As we grow (which we will inevitably do) i hope that we maintain this atmosphere as I will remove any signs of this aggression at the Car Boot. I think it;'s just the area and manner that the Car Boot runs in. i know that most people speak highly of the Car Boot. It is meant to be fun. Occasionally we will get people, who haven't sold well on their appearance at Stonham, saying it's this or that but, to judge somewhere you have to go more than once and in different climates and days as we have event days, we have good weather days and we have supposedly quieter days when their aren't any other things going on at Stonham and often they are the best sell at days. We do, of course, have two big days coming up at the Car Boot and Stonham. One is Loco, which is the German Car Show and the other is the Retro Dub Show which is a VW event and allegedly going to be packed. I can see the german car Show also being busy too as there just aren't many German Car Shows. With these, I don't think that bad weather will stop the numbers. Especially the Dub Show as both showgrounds are already booked with people camping there. I'm a bit scared to write about the recent good weather in case it stops. That's 3 weeks of good weather on a Sunday in a row which is great for the Car Boot. We've had the VW Show and now the Classic Car Show both were hugely successful with great crowds for both. The Car Show was packed and it was great again for everyone to watch the Cars driving in as they sold at the Car Boot. We have Kite Flying this Sunday and this isn't just a few people on a hill it is actually a selection of experts plus there will be plenty to see and do including competitions and prizes, face painting, zorbing, bouncy castle and much more. So, this will bring in families and new people to Stonham but, more importantly we need good weather again. The Stalls have been booking well each week. We only have 20 but, these are so handy. You just pull up behind one, place a blanket on the top and lay your items all around, under and on top of the surface. these are market stalls so, you can hang things from the framework as well. The good bit is that you clear your rubbish and load up and off you go at the end. these are £10 each rather than £5 for cars bringing their own tables. I actually lost a board last week which is pretty good considering I lost all them some weeks. Most people don't touch other people's signs but, I must have upset someone and they removed the sign. This was outside Needham Car Boot where we have a board every week. I expect I may have stared at a car driving too close to me as I put it up which has merited the action but, never mind. I actually put these up Friday evening after getting back from work so, i'm never in a great mood when doing this but, it is actually quite peaceful. I always say to people to say hello or bib but, quite often cars take this to the other extreme and make me jump as they go past. I've tried not to wave back as my two fingered wave seems to be misconstrued ; ). All are welcome to come and join in as i end the evening by popping in the Retreat for a drink afterwards. After a long day it's nice to have 20 minutes in there relaxing as i'm up early on Saturday stocking up the Food Trailer, checking signs, putting out the Car Boot stalls. I have a new cooker for the Food Trailer which i'm hoping will improve the speed of the Food Cooking. It's been a bit busy of late . Always so, much to do.. I 'm hoping to put the cooker in before next Sundays Car Boot. We have some big events coming in September with the Loco German car Show followed by the Retro Dub which is looking like the busiest event at Stonham since we have been there. This may be a dilemma with the sheer number of people at Stonham. I will keep you up to date with that as I have a feeling we may be asked to go back to the other side for that day.. There are 3500 people expected at the show and still rising. At last. A great days weather and the first in about 4 or 5 Sundays. We managed a few hours on the 26th July and some sales on the previous Sundays but.. we had a good full field yesterday and the weather is looking good for August suddenly. Perfect timing for the VW enthusiasts and the Car Show which are the next two Sundays. Suddenly, all the poor weather we have had is forgotten as it was a good Sunday and i'm hoping for numbers to carry on especially with the shows on. We have a lot of people camping all week which means they will be there as buyers and you then get all the VW fans coming on Sunday. the following Sunday we have the same with the Car Show which is always packed with cars. Suddenly i'm excited about having a full field. What a strange month it has been so far. We have had good mornings followed by rain and swift endings, we have had rained off completely although some still persevered and sold and last week we had a wet start followed by a good morning and suddenly rain again. So, it's about time we had a Sunday with decent weather. This Sunday looks like a perfect opportunity and we have the harmony Festival so, i'm expecting a good turn out. I think this is the event that has come from Jimmy's Farm and decided to try Stonham so, it should be good. I will let you know next week if it is..
We finally moved to the other side and I think it is a good idea so, get used to it. I loved the other side but, the area has reduced, the hard ground is now needed for coaches and the view of the brown sheds isn't the one we used to have. The other side is larger and allows us to offer unlimited space to sellers. The first week and we had 80 odd sellers and Summer is finally upon us. I expect we will beat our 122 record soon as numbers are on the up and better still people are buying at Stonham whereas I hear that that isn't the case at many Car Boots. I'll quickly add that it doesn't mean that you are guaranteed £100's of pounds whatever you sell.. Car Boots are a fine art and there are many at Car Boots that buy well and sell better which is what Car Boots are to so many. We have a few big events coming up but, generally Stonham has been buzzing with people and it really is a great venue for a Car Boot. Decent toilets, shops, attractions, people camping and living at Stonham and we are on the Tourist Route. Things are looking up at Stonham and on top of that the atmosphere and crowd is a really friendly one. I'm not aware of any thefts ever since we started and no one harrasses anyone and everyone is genuinely friendly. this is because most the people selling are one off people, normal folk and very few commercial sellers if any. I don't think you can beat it. I'm a tad bias but, it's hard to beat. A little bity subdued for the last two weeks as the weather hasn't been great. We still opened on the 14th when most others closed and had all the covered stalls sold so, we had a car boot sale. Last Sunday was Fathers Day and I can remember it being the same every Fathers Day and that's very slow byer wise. Everyone seems to stay at home or go for a meal or do anything other than go to a Car Boot. Having said that we did have quite a lot of buyers it just ended a little earlier than normal. I expect all Car Boots are the same all over the place but, we enevr really know if the draw of Stonham and all it's new shops will pull thepeople in anyway. Next Sunday we have a Country Music Festival which is a new one at Stonham. I'm interseted to see if we'll get lots of visitors on horseback and large American Cars turning up! I don't think that there are many Country Music festivals so, i'm hoping it will get a good following and with camping available i expect to see many viewing and participating at the Car Boot. Back to the warm weather and a great crowd last Sunday. The Mid Suffolk Vintage Show was on but, I was so busy that I didn't see if this was a success or not. it certainly seemed to swell the crowd. The week before it rained all day on and off and despite sellers still having a go it wasn't our best day. The Vaglogic Car Show was a success the week before that and it's been a strange year. I keep hearing about other Car Boots doing well or not doing well or having a lot of problems with thefts. We just don't seem to have the same problem at Stonham Barns probably because it's a good area and quite a wealthy one. Everyone that attends seems to adopt the same attitude which is one of relaxation. I got an email, which was pleasing, from a new customer saying that they had lots of room, loved the atmosphere and sold well. Thanks for that as it's so nice to receive emails like that. Each week I hear similar quotes from people but, it's always aligned with other people saying the complete opposite because they haven't sold as well. These are the people that were glowing with praise the week before that when they did sell well. It's not about just sales it's about the place, the people, the friendliness of everyone and sometimes the fact that they are still trying to sell the same pieces that didn't sell well the week before. the good bits go and that's life. You cannot expect everyone to have the same taste as you. Eventually you will find someone that likes that item but, what can I say... Car boots do make me laugh. We have another event this Sunday with the Stonham Barns Dog Extravaganza. I have a dog but, it's not my thing but, I know there will be lots of people with dogs there. We are probably moving to the other side of the field as we are starting to fill up our reducing area. we had to put some on both sides last week since the verge has encroached the Car Boot bit. This is ceratinly a much bigger area and I think it makes sense to be visible from the road. What do you think? I'm hoping for a few weeks of good weather rather than one on one off which is hindering the number of sellers. We get a good steady 70 to 80 at the moment but, as fast as we get that we are rained off and it drops down. We have had 120 there so, it would be good to get back to those numbers every week. We certainly have the buyers to merit that many. especially at this time of year when Stonham is so busy. OK, I have been a little slack doing this. So much to do all the time. The last Two Sundays have been good weather and it makes such a difference to the Car Boot. On the 9th we had the Vintage Cars leaving Stonham to go on a charity Drive, last week we had the Antique/Collectors Fair and this Sunday we have the Vaglogic VW show. Not all of these are everyone's cup of tea but, it means a whole new crowd to Stonham each week which means new buyers. Last week, for example, because we opened before the Antique Fair all the sellers from the fair + traders appeared early at the Car Boot to buy and more than likely re-sell in the Collectors Fair. Dog eat dog in the selling trade. Many people complain that they see their items selling for £20 more at events like these but, if they set a price and are happy to get that price why complain... It doesn't make sense. Most people at Car Boots have a price they know they want for items. People that buy either buy for themselves or buy to sell at a higher price. That's life. Stonham, at this time of year, is a great place to sell at because we do have people staying in the campsite and holiday homes plus being on the Coastal Route you can't just pass without having a peak at the Car Boot. Plus of course we have the events that attract extra people into Stonham. I'm hoping that the weather continues as it has done because as fast as we grow one poor weather Sunday knocks it back a little. This was even better than the week before. Beautiful morning and we were filling up at 7am which is always a good sign. 70 odd sellers, a huge buying crowd which was boosted by the 350+ people camping for the Custom Car Show. These events are really picking up now as this was the 4th year it had been at Stonham. We have a few events that have been running for a while now and one is the Mid Suffolk Show which will be another big one. make sure you sell at that one as it will be busy. As I mentioned earlier the sign stealing has stopped for a while now. the police have been watching the route and waiting so, hopefully the culpret will be stopped completely soon. I can only reiterate that we are independent of Stonham so, you are hurting me rather than Stonham by taking the Car Boot signs. I'm not sure why you are taking them but, if you want to explain to me you can call me and I'm always willing to relocate them if you have good reason for them to be moved..
Too good to be true to have two weeks in a row but... absolutely horrible day and as much as we tried the rain didn'ty stop and the Car Boot was finally cancelled. Signs disappeare as well so, generally a poor day. Another week gone and yet another strange one. Weather predicted to be brilliant so, come 6am on Sunday morning it's raining. By 7.30 it was still raining. A week waiting and it's feeling like it's going to be a nightmare. Suddenly the rain stops and people turn up at 8am onwards. So confusing running a Car boot.m We had a good day with good numbers of sellers and buyers and it was our best so far this year. I couldn't have imagined that at 7.30am. This week the weather is back to being a bad forecast so, I'm hoping that the public just ignore it and wait until Sunday morning to decide. As stated a million times we are open either way. It's so frustrating because most Sundays it looks fine and the weather forecast predicts otherwise. Anyway, no signs taken. That's a start. The only confusing thing is that I haven't heard a word from the police. I'm going to chase them. I suppose it was too good to be true to expect decent weather two weeks running. But, if you read the forecasts it had said that it was going to rain all day and then suddenly it was just due to rain first thing. Well, I didn't see any rain all day. Yes, it was freezing and this affected numbers but, considering this we had loads of buyers and despite lots of signs being stolen yet again it worked out ok. So, in the last three weeks I had 20 to 30 signs taken one week, followed by 4 the next, followed by 15 last Sunday. The police are dealing with it and hopefully we will see the end of it but, for three years this has gone on. The Farmers Market lost all of there's before the Farmers Market.. what is up with someone. I can understand if someone disliked the signs but why not discuss it. It seems to be Stonham Barns based only and I don't even have anything to do with Stonham Barns. So, if the person is reading this email me and try and explain why you have to do this. The police have your number plate so, it will stop but, it must take you ages to go round and do this which means that you need to refocus your attention. We all re-make signs but, in my case, this is affecting numbers to the Car Boot. I am a public person who rents the field at Stonham and each week has to pay for new wood/signs/print on top of tall the other costs. If your argument is against Stonham Barns please discuss it. Either way, I have nothing to do with Stonham so, you are causing a huge amount of stress to me. As well as costs and wasted time. Well, as I said numbers were down but, we are seeing good numbers at Stonham of buyers which is the important thing. Started slowly but, the weather was great and suddenly we had a crowd. Lots of sellers and loads of buyers. Really pleased as everyone seemed to sell well. Stonham in the sun is so much different to other Car boots as it's such a nice atmosphere. We know that everyone loves this about the Car Boot and we have now added a really good buying crowd to Stonham. In fact, even when the weather has been poor and numbers of sellers are down everyone still sells well. I don't think you can say that about many places. The field has been repaired and the muddy bits filled in and rolled & mowed. So, it's looking the part again. If I had the time i'd go round and remove all the little stones and work on getting the cricket green that we used to have there. Again, another disappointing day at Stonham and totally because of the incorrect Weather Forecast. I actually had a nightmare weekend because I finished placing the signs and drove around Saturday admiring them (as you do) and then received a call that someone was loading them into their car. My partner got the call and was in the midst of teaching an Upholstery Course so the details were vague.I was told that it was on a roundabout on the A140 or something like that. This narrowed it to Junction 51 of the A14 however, what they meant was the junction of the A1120 and A140 where they may have been a roundabout. By the time I got there there was no signs and no one there. I then spent the next few hours going back and forth and then replaced the missing signs with three more quickly made versions. The next time I got a chance to drive around (about 5pm) those three new signs had also been stolen as had about 20 plus signs in total. I've written on here before about this and how wrong it is. I have no idea why someone would find it that distressing to see my signs. 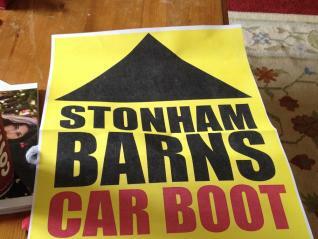 The council have agreed that I can place them so, it isn't them and you would have thought that most people accept that the Car Boot is a fun day for most and independently run so nothing to do with Stonham Barns. I know that anyone that puts signs up that have anything to do with Stonham Barns seem to lose signs (Circus, Antique fairs etc etc). All have complained about this. I'm sure some think it's me as they are events running at the same time but, you only have to look at the site we put out and you will see that I promote all events even if it means that I lose out financially on sellers as I am always happy to have more people at Stonham. Now, there is some good news in this and that is I have the number plate, so I know who you are... I have placed a message on facebook but, no one seems to know the person so, I did what I had to do and have notified the police. I'd like to reiterate that i'm not interested in getting the person into trouble but, have no choice but to do this as it happens every few weeks and it comes out of my pocket. It also wastes all the hours I spend putting them out late on a Friday evening. So, i'm sorry but, there is no reason to do this as far as I can see so, I'd like my signs back and for this to stop. The Police give me no option obecause they aren't prepared to just smack their hands and get the signs back. So, you have to make a case of it. It won't be anything major but, hopefully I can find out why they are doing it and hopefully it will now stop. Sadly, I now have to make new one's, put them out, probably lose them again before the Police get round to stopping the individual. Looking for supposedly better weather this Sunday and hoping that Stonham fill in the wet bits and we have a great crowd this Sunday. We are getting the buyers and now just need a few more sellers.. See you from 8am. Unusually disappointing week. The early frost seemed to put off a lot of people although many sellers arrived late and arrived after 9am as they realised that it was actually a lovely morning. Yes, it was bitterly cold with a wind that came and went but, again we had great numbers of buyers. The field is soggy on the edges but, we do have the stalls on the hard ground and I move the sellers around each week to keep them on non soggy areas. A good week of wind and then perhaps even sun should dry up the field. it doesn't take much to clear the surface at Stonham as it is a sturdy/well drained area. Don't let this put you off as it is a great venue and a bit of sunshine and the place fills up. As usual i'd like to thank everyone that comes and all the sellers. Each week I hear everyone saying how friendly the buyers are. We do get the early morning dealers popping in but, even they take on the friendliness of the place. See you on Sunday from 8am. Again another good turn out with increased numbers. The pleasing bit is obviously the fact that we have been closed for the first time since we began and the buyers are all appearing. We are obviously a traditional Car Boot so, we tend to rely upon the people that suddenly decide to do a Car Boot and clear their lofts so, it's down to how good the forecast is for these but, the buyers are there and waiting so, don't be shy. Really pleased with the improvement from the week before so, hopefully this will continue each week now until Spring and then grow dramatically as the weather improves. I'll keep this short rather than ramble on. But, everything has started well and we will be here until November now, so, if you can't make it one week, try the next. Really pleased with the first week at Stonham. To put it into context. needham started on Saturday and although was a bit iffy they had 6 sellers. We had 20 odd and although it isn't what we expect this is in February when it's been freezing and icy lately. The weather was better Sunday albeit cold but the thing that really please me was the amount of buyers venturing out. I did get asked by many if it would improve with the number of sellers but, it seemed quite a daft question. The fact that Needham had 6 sellers and I expect they were probably asked the same question. At this time of year and open for the first time since November 30th you cannot expect everyone to just appear on the same day. I'm still thinking about when to start next year as it was such a good turn out of buyers that I will see what they think before I agree to start on February 1st. It might make sense to start on March 1st but, we will see. It really depends upon the field. Stonham seem to be building all over the place so, I will have to think about moving to the other side soon. As far as Stonham goes they are launching a radio campaign and neatening up various bits but, it would have been nice if they have done that already. Anyone reading this for the first time you used to be able to write back to me on it and follow the blog but, if you have anything to say or ask just call me or email as i listen to everything. Speaking of which if there are any Doughnut sellers please contact me as i'm feeling generous and allowing one on. But, you will need to be someone that fits in well as we are a Traditional Car Boot and we have a good crowd. Well what can you say. To be expected I suppose. It was absolutely freezing, blowing a gale and then raining and all at the same time. Amazingly we still had sellers willing to set up but, I advised them that as much as they wanted to set up we just wouldn't get buyers coming out in such awful conditions. I was pretty right because I didn't see a single person come in although I did see a few drive and then stop outside and look in. Warmer weather is expected this Sunday so, i'm positive as always as even Needham starts this Saturday. Typically they will get a warm morning on their first opening day. Full boards will be out tonight (Friday) so, i'm looking at everyone seeing the boards longer than they did last week as I was hampered by poor weather and a Land Rover that just doewsn't want to start. The Food Trailer has had a spring clean and looks better although I will be taking it home every two weeks and making sure that it is kept mud free and painted. I'm looking forward to this year as always we have such a good reputation and i'm hoping that we will grow a lot more as we are a year older. I'm also looking to get signs printed rather than my hand made signs. I've got fed up with these being taken and moved. I'm also hoping to get some more help as Ian has decided that he can't help move everything around anymore. I know he would have done if he could but, i'm looking forward to seeing him selling more this year. I've also asked Ian Ainsley to help Sunday mornings. Some of you will recognise him from Rougham. Anyway, Happy New Year and I hope to see lots more of you turning up. The field isn't in a great way at the moment but, I have a meeting this Saturday with Stonham and hope to discuss it being rolled and flattened so, we are ready for warmer weather. I may ask to use the Car Park if it continues to rain but, i'll be there with sand and will see how it is on Saturday. Another wishy washy day and to be honest quite appalling weather. Sellers again turned up despite the awful conditions. The covered stalls were used by everyone turning up. The field is actually ok but where everyone is driving across it to get to the stalls it is cutting up a bit. A few days without rain and it will be back to normal but, we really have had terrible weather and it's been constant rain. Sellers bought off each other and some brave buyers did turn up but, no one was going to become a millionaire on Sunday. So, we have one more left this year and I'm just hoping that we end with a nice warm day or a day just without rain. I think it's the prefect time to stop. As everyone knows we used to stay open all year but, it's just not feasible now. Everyone has said what a pity it is but, I remember opening in thick snow and ice with 3 sellers there and we were all cuddling the tea urn.. As I've said before we only hire the field at Stonham Barns. At some point all Car Boots seem to have this problem with the venues whereby, they see good crowds and think that we ought to pay a bit more to rent the fields. We have always kept the prices down at Stonham, so that sellers are not charged too much. We have been very fortunate that Stonham have helped us along the way. I know that other Car Boots are rumoured to be closing and this is because the owners are demanding too much to use the fields. They will end up with no-one hiring the field. It's really sad that all that effort to start a Car Boot is then taken away from the organiser and offered to the highest bidder. I know how much time and effort we have put into the Car Boot so, it is an upsetting thought. Another 2 weeks gone by and it’s rained on both (eventually). Each time I’ve been pleased with the numbers of people that have turned up despite the pending rain. I’ve put a comment on the main car boot page about the end of November being a good decision for stopping the Car Boot. The constant rain and the way that the edges of the field tend to cut up has meant that it’s probably a good time to stop. Also, around the corner is Xmas and everyone’s mind are taken away by the urge to head to the high streets. The fields at Stonham drain amazingly so, it’s not like some of the other car boots that become a swamp. We’ve placed the covered stalls on the hard ground and are keeping the main field open for £5 sellers still. The real problem is that if the weather is potentially bad everyone decides to stay in. Naturally, we all get the buyers that go to all the car boots in the area and also the diehards but, car boots rely upon good weather and the passing crowds. At Stonham we are on the main tourist route to the coast and as well as the attractions and shops have the holiday makers in Summer + campers and holiday home crowd. As it get’s into Winter not so many people are heading to the coast! Everyone has, as usual, said to many that we should stay open for Winter but, this is the selfish one’s that are thinking of finding themselves somewhere to sell at only to change the mind come the time. For the last two years we have sat in zero conditions in snow, blizzards and rain. yes, amazingly we always got sellers but, we need at least 20 or 30 sellers to keep the buyers happy and to cover costs of running a car boot. Well, we have two more to go and i’m hoping for some token decent weather and two days without rain…. we will see. Two more weeks have gone by and the weather has been quite poor. I’m amazed how many turn out despite the forecasts but, they do continue to get it wrong. On the 26th we had good numbers in the end considering. The same with the 2nd. I had read all week and even the same day that it would rain. It didn’t really rain at all until about 12pm. Some sold really well and I’d say that most people were genuinely happy to have sold so well despite the expected poor conditions. On both weeks it has been cold and gloomy but, we have the covered stalls offering some protection and we literally sold out bar 2 last week of those. I’m hoping that the last 4 Car Boots this year will be good but, the scaremongers are saying it’s going to be freezing. Cold is fine it’s just rain that kills Car Boots. Lots of people have stated that it’s a shame we are closing for December/January but, we really don’t have any choice. We have to pay a set fee irrespective of the weather and despite being so fortunate with the public’s continued love of Car Boots the weather will deteriorate. I think that only Needham and Portman Road will carry on a bit longer than us but, the majority of Car Boots have stopped already. Everyone says to me that we should carry on but, they all said this last year and the year before when we opened in the snow :) and they didn’t turn up. I’ve said this lots of times I know and it always amazes me when we have people selling at Stonham when we have ice and snow on the ground. I know we get the odd 50/60 + sellers in Winter but, when there are 10 there and we are all cuddling the tea urn you start to wonder if it’s all worth it. Speaking of which I am still looking for that one venue in Ipswich that would enable us to run all year. I really don’t know a venue that has indoor facilities and enough for 100+ sellers. Toys R Us was a good venue but, thanks to them letting everyone down we had to stop that. We were discussing this the other day. If we were running that still it would be huge by now. I expect it would have caused problems either way because it would have taken over the car park at Toys R Us. Still never mind. Just a last message to say that we will be opening each week until 30th November and that’s irrespective of the weather. Make sure you come on down because we don’t ever flood and once the rain stops we get going. So, don’t just sit there in a puddle elsewhere come to Stonham and that includes all the buyers too as we will always have sellers. Two very different weeks. On the 12th we had a great buying crowd. The weather was, as usual, supposedly bad but, was in fact, great. This always has an affect on numbers selling but, we seem to get a good consistent crowd of sellers and we also have the pleasure of people literally every week that haven’t been before. I’m sure others say the same but, we really do get new people each week. I think the majority of sellers on the 12th went home happy because the crowds grew as the day went on. We often start slowly but, by finishing time a good all day crowd had turned up. i think the way of judging it was the fact that everyone was still there at gone 1pm. A good sign. The good weather does have a lot to do with it but, the weather brings a lot of people to Stonham. Last Sunday (19th) was a big contrast to the previous Sunday. When we arrived at 6am it had gone from spitting to all out heavy rain. I kept tapping my trusted device which was telling me it would be cloudy. By roughly 8am it finally stopped. Many other Car Boots had probably given up by then but, we had a good selection waiting to see what the weather would do. It was quite a shocking morning but Stonham always drains instantly and only the areas near the food trailer (hard ground) actually get wet. I expect that many people looked out at 8am and decided against going to the car boot but, we always soldier on and quickly the day became quite a nice on. naturally numbers weren’t as good as the week before but, no one looked too jaded. No one would have become millionaires but, all sold and some even sold well. Perhaps, with the way the weather has been looking lately, you can understand why we are closing from November 30th. Knowing the way it works I expect a heatwave in December but, we have made up our mind. Having gone through two very cold winters it makes sense to do what the others do and close in December and January and start again on February 1st 2015. It gives me time to repaint everything, re-do all the signs and maybe improve the food trailer. I know I always go on about getting up all week at 5am it will be nice not to have to do it on Saturday and Sunday getting food for the Car Boot and setting up the stalls. I will probably mope a bit whenever the weather is good but, everyone else stops so, we are going to. It’s only December and January so, it’s not for long. Do make sure you take a note and make sure you come back on February 1st 2015 as I don’t want to find only a few at Stonham Barns on the first Sunday. Keep a look out for the signs as they will suddenly appear when we are starting again. One thing I forgot to say was well done to all the sellers that persevered last Sunday. We have to pay a set fee for the field no matter the weather so, it was great that everyone waited and gave it a go. It meant that we covered costs which was great considering how awful it looked at 7.45. really appreciate the continued support of everyone. You didn’t think i’d get the time to fill this in did you. I’m so busy these days and fishface also has a new shop opening in Ipswich soon and we do have a new website opening literally in a week. Sadly, the format will change and we won’t be a blog as such but, we will still have the blog page and you can still respond to it just not quite in the same way. I presently have 2500+ followers on here. I expect that the majority are electrical but, it makes me feel important. The Car Boot has been perched on the side of fishface’s website and finally fishface will start to look like a proper website. You will have to wait and see but, a new layout is there and more importantly the Car Boot will still have two pages. Not sure how much you notice but, I have changed the url on this page so, we are no longer page_264 or whatever it was. If I’d known it was so easy I would have done it ages ago. This page is now www.fishface.co/stonhambarnscarbootblog and not a strange number. Anyhow that’s enough waffle. Last Sunday was less sellers possibly cause the forecast was up and down and it was blinking freezing at 6am when I arrived. It turned out to be a beautiful day. I was quite pleased because it filled up at 8am rather than 6am and with the weather improving we ended up with a good buying crowd. it carried on to closer to 2pm rather than being finished by 12 so, it was a perfect day. I’m always critical of the Car boot because I’ve seen it massively busy and also quieter. I don’t know how much everyone notices but, I have started to place mentions of us being an independent Car Boot that’s family run. The reason behind this is because there always seems to be so many politics around Stonham and we have nothing to do with anything that is planned, not planned or going on. We are just a mere and genuine Car Boot that hires the field and occurs every Sunday until the end of November. I’m dropping in so much information today. Yes, we are stopping on November 30th and restarting on February 1st. Part of me is sad but, part of me is counting the days.Naturally i’m fearing having to start up having been closed for Christmas but, i’m sure that everyone will be biting at their steering wheels by the time February arrives. We have run throughout winter for two years and along with Portman Road have stood freezing on some occasions. I say good luck to Portman if they carry on but, as good as some weeks are there are many where we had to huddle around the tea urn and do so for ten sellers. In the past we could have done this but, we now have to pay set rates irrespective of the numbers turning up. This seems to happen in Suffolk… just when you think that people realise how much effort you put in and how important it is to stay open to get people into the site suddenly people get greedy and want part of something that’s doing well. Anyhow, to cut a long story short we are closing in November and starting in February again. I do need a rest as I get up 6 to 7 days at 5am and generally neglect my family :(. Being me i’m disappointed that we won’t be part of any Xmas events at Stonham but, I don’t get any holiday all year so, it will be nice not to have to plan anything. Last Sunday’s Car Boot was pretty good. We will be into our third year next year and at some point we will do what Needham did and that is become a large Car Boot. There really isn’t any reason why we aren’t already except that it takes time for the public to decide that you are actually a decent event. We have loads of fans and most people love the atmosphere but, we get people that do Car Boots now and then and want to come to a venue where you can sell without any hassle at all and deal with a really decent genuine crowd of buyers. It’s quite strange really because we went through a stage when we suddenly had a cross section of Suffolk coming but, it’s gone back to being a very British crowd (if that makes sense to you all). maybe we don’t get this section because they are unable to hassle the sellers? Our resident plant seller says to me every week that he doesn’t understand why we aren’t packed because it’s a great venue with loads going on and the only one with events. The answer is as I said earlier. We pick up fans each week and just wait until everyone suddenly decides that it is actually a great place to go. Don’t get me wrong we get loyal fans coming every week but, some times it’s rammed the next week it is busy but, not as busy as rammed. No idea where these people suddenly go but, I get new faces every week and long may it continue. I wrote a piece on a website yesterday about selling at Car Boots. It started off as a piece about coming to the Car Boot and ended up being a point about selling at car boots. the reason I wrote it was because I spotted someone on facebook asking about a good car boot to go to on Sundays. Wonderfully someone wrote Stonham. Someone added Woolpit and so on. Great. Such choice. A bit later someone wrote that Stonham was XXXX and recommended Woolpit. At the end of the day the Car Booter in question said that he went to Woolpit and it was XXXX. This really annoys me and gets me going. Woolpit isn’t rubbish and neither is Stonham. they are very different but, they all have their fans. Each to their own. What it stems down to is the fact that the said person didn’t sell at the Car Boot therefore it’s rubbish. On my piece I spoke about selling at car boots and how the good sellers change their stock and buy only items that they know will sell. The people that tend to sell at Car Boots out of necessity are the one’s that choose absolutely stacked venues. To me this is the worst thing you could possibly do. Huge car boots have masses of competition and I don’t think you are any more likely to sell at a large car boot with loads of buyers compared to selling at a smaller car boot with less buyers. The reason being is that people are looking for bargains. Also, if there is lots of competition unless you have something that no one else has you may not sell. I still feel that the recession is playing havoc with car boots. People are looking but not buying unless it’s really needed or underpriced. if you are at a Car Boot with less sellers it is more likely that the buyers will look at everything you have rather than scouting quickly the items on the table. At Stonham we have people that sell £100’s of pounds worth every time they come. As I said before they don’t do it every week. I used to go round asking people how they got on and you could see that some people seem to think that people will buy their items despite the fact that I couldn’t personally see anything I’d take if offered for nothing. I did go into one about also being the person that took the pitch money and therefore people would try and say they had sold nothing to try and get me to offer them a free entry ticket (I did this when we first started). Car Boots are exactly what they are. You can have a great day or a poor day. You can come the week later with the same items and sell the lot. It takes one person to make it a financially good day. Either way… for someone to say that a car boot is XXXX upsets me because so many people read these things and when searching words could possibly see someones wrong opinion. the power of computers. Should I respond to that person? I actually didn’t but, if Sunday has one seller and two buyers i’d be extremely shocked. Anyhow I’ve had more than that book covered stalls for this Sunday so, that won’t happen but, you know what I mean. It does upset me though. All around that person who says that a car Boot is XXXX there are people selling well that love the Car Boot but… one persons opinion is suddenly the be all and end of all everything. That Car Boot to new readers is suddenly XXXX. Not that that person had a pile of second hand tissues or similar poor quality items but, the car boot was unable to shift their items. I’m sure that it must be depressing if you don’t sell well but, we only supply the place to sell. - we'd love to know what you think! I have been here once ( 2015 ), it was a lovely day. the staff and fellow car booters were friendly. mind you, they did check out what I was selling. If I come to carboot what time do people pack up again? I want to bring my teddy bear stall but lcan't be away all day. Hello Simon, my wife and I would like to book a covered stall for 25th June or 2nd July. If available, can I do this over the phone with a debit card? Hi can u tell me are u doing bootsales this year 2017, if so can u tell me what day u will be starting. Hi st ! How did this. Damp Sunday go ? Is there going to be a boot sale this Sunday, Mothering Sunday please? Thinking of selling. I always have spare signs but, such was my estensive list of jobs that I didn’t get time to replace them. This Sunday we are back to being the only event at Stonham so, I’ll replace the lost signs and carry on. I get this problem every time an event is at Stonham. The organisers of other events are quite happy to poach the Car Boot crowd but, don’t want to allow my signs that are there every week because their event is obviously much more important. Another few weeks have passed and from what I have heard Car Boots seem to be going through a quiet period. This makes me feel a bit better because we have also been a lot quieter than normal. Last week was understandable because the whole area was allegedly rained upon except Stonham.. The problem I often have is that I struggle to get a decent signal on my phone at Stonham and it’s not as if I can phone every buyer in Suffolk. We have kept up good numbers of sellers but, many that are coming for the first time are probably thinking that Stonham was always like this. Well, I can definitely state that that isn’t the case. This really annoys me. Two weeks ago we had 80 odd sellers for a non event day and it wasn’t as busy as I would have expected. It doesn’t make much sense. The weathers ok and you’d expect everyone to turn up as normal. I’ve spend 2 years writing and talking about the Suffolk factor but, I still cannot find the reason. I think that the biggest problem is the fact that we are constantly told that the recession is over. Unfortunately the general public are still earning the same amounts and costs are still higher than they should be so, something has to go. That tends to be luxuries or small car Boot gifts that they probably don’t really need. Car Boots are affected by warm weather (nice weather means a trip to the beach is better), cold weather (let’s stay in), end of the month (haven’t been paid yet) and of course other events in the area that are suddenly more important. I do go to Needham on Saturdays (occasionally) and they suffer from exactly the same. They are lucky because the public still turn up in large selling numbers but, the public are presently looking but, not buying. There is, of course, the added online free selling pages on facebook that make going to a car boot not so attractive as well. So, it’s a real head scratching time. Needham are fortunate because they still make their money whether people sell well or not. We tend to have to try a lot harder because we are newer. Hence, we advertise a lot more than other Car Boots. So, what is the solution.. I’m not sure at the moment. We have an event this Sunday which breaks the rules. I say that because we get a whole new crowd, in addition to the regulars. We are lucky with that as we have events at Stonham. So, I expect a good turn out this Sunday. The last two weeks have been a little disappointing. We had the Kite Show followed by the German Car Show which I had advertised everywhere. We actually had more sellers for the Kite Flying day which was totally strange seeing as I had really flooded the market with so much online advertising. We had good numbers of sellers at both but, buyers were suddenly down on recent weeks. I’ve given up trying to work it out but, we had fog last week and a few neighbouring events but, this shouldn’t stop the buyers as they can pop into several locations. I wish someone would give me a definitive answer. We know that everyone loves the atmosphere of the Car Boot and the fact that the buying crowd is friendly and you can set up in peace. So, if everyone loves it and some sell much better at ours than at other ones and we know that the buying public equally love it at Stonham so, why does it fluctuate so much. I see some people every week for months then, you don’t see them for 6 months. Many of the buyers at Stonham don’t come specifically to buy but, it’s a great friendly place to be. naturally the weather plays a huge part but, it has been ok at Stonham. I’m intrigued to see what happens this Sunday as we are expecting good weather. This sometimes means that many people head to the beach but, I don’t think it will be that warm. The good weather makes Stonham a good place to be so i’m unsure how we will do. I’ve had bookings for the covered stalls so, it’s looking promising. I may have to persuade everyone to come once and then get changed and return again. I’m only joking. It’s just strange that we are packed one week and then quiet the next. I’m always open to suggestions and thoughts from readers but… i’m as stumped with this as I am with the disappearing signs. This Sunday could suddenly go the other way and be swarmed. Who knows. We always get good numbers of sellers and may that continue. I expect that suddenly one week we will move up a level and increase again and get over 100 sellers every week. Ok Ok i’ve been poor lately but, I have been promoting the car boot heavily and the last 4 weeks has seen 75, 100, 70 and 75 sellers. We would have beaten the 112 if the weather had been better with the Car Show but, we still have the German Car show Sunday week. This Sunday we have Kite Flying which should bring in some families. The weather has been better lately on Sundays and we are due another decent day this Sunday (31st). promise I will try and do this every week now. Last week we lost signs again which was annoying as I thought we were past that. It can only be the council or another event deciding that we are a threat. This is daft because our fellow Car Boots seem more worried by their own car boots to bother with things like this. So, I will report back again on Monday after seeing how we get on. I’m expecting another 80 odd sellers and another big buying crowd. I’ve been a bit miffed with the weather but, in awe of our sellers. I have to say what a determined load we have. We seem to get new people every week which must be because of all the advertising I do but, despite the poor weather we have had for 2 or three Sundays we are still getting 30 to 40 odd coming and although Suffolk people are notoriously poor in bad weather I think everyone has still sold. Last week we even had two girls turn up to do eyelashes and eyebrows and they still managed to get some business. I think that says everything really. Naturally, a rainy day at Stonham wouldn’t be my idea of a good place to sell these services but, they turned up and hats off to them. I have said this a million times befoe but, I hope that people realise that Stonham Barns Car Boot is a vibrant place and if the weather is poor you do get less than normal amounts of people. I do hope people realise this and make the effort to come when they know the weather is ok. The weather has meant that we run the Car Boots on a non profit basis and as tiring as it all is I do still enjoy being in the field at Stonham. I think that Car Boots have suffered a little this year with the recession. People are choosing what to spend money on and the number of sellers has remained consistent rather than grow from last year. We do have HESFES next Sunday (27th July) which should be a really busy day but, I know that other Car Boots have lost custom this year. We have held our ground despite the number of Sunday Car Boots rising each year. From facebook, twitter and the various social websites I can see that we are still picking up more and more friends each week so, we are still liked which is important to us. The weather has been boiling this week and naturally, come the weekend, threatened with rain. We are due a warm Sunday but, we do get good numbers considering so, I won’t complain. Oh, what i was going to say was that I hope people don’t think that the Car Boot is at it’s maximum when we have 30 sellers on a rainy day. Some have never been before and ask if it’s always like this. Call me dopey if you like but, rain all over Suffolk, most other Car Boots closed and us open with 30 to 40 sellers is a miracle really. Many have never been to a Car Boot or have been to a packed one in the sun. You would think that it’s pretty obvious.. But, if it rains again I may start my normal rain moan. I feel a bit for Needham as they have had worse weather than us lately with the Saturdays often rained off. There are definitely similar patterns there with people not buying as much as Needham too. We are in a wealthier part which means that we do get holiday makers visiting the shops and staying in the campsite or just on the tourist route through so, you can still be very lucky at the Car Boot with the right stuff. Especially the once off loft clearers which we tend to get more of and the Antique sellers. Generally though despite me being absolutely knackered cooking all the food and still working in London, putting signs out and pushing the stalls around everything has been ok.